Of all the factors that led to off-target movement of dicamba in 2017, volatility remains the most controversial. Older formulations, such as Banvel and Clarity, have long been known to volatilize when sprayed under certain environmental conditions. Engenia, FeXapan and XtendiMax were all marketed as dicamba formulations substantially lower in volatility than previous formulations. Volatility is the movement of an herbicide as a gas or vapor after a spray application hits its target. It results from molecules of the chemical vaporizing from the surface of the plants or soil into the air. While the industry has repeatedly acknowledged low volatility does not mean “no volatility,” it also attributed most of the off-target movement in 2017 to application issues, contaminated tank mixes and/or other types of human error. Wading into this debate results in a quagmire of data with many of the studies still ongoing. While EPA acknowledged volatility as a potential problem when it revised labels last fall, the revisions did not specifically address volatility. 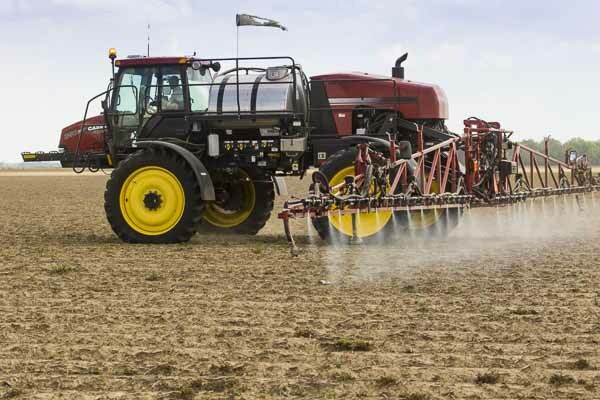 So, DTN asked several weed scientists and researchers to suggest what applicators can do to limit the potential of this type of secondary movement. Volatility is largely driven by temperature, said Tom Mueller, a University of Tennessee weed scientist, who has been working with dicamba compounds and measuring their movement for more than a decade. Based on laboratory studies, Mueller said dicamba emissions following application appear to be directly related to temperature, with more dicamba emissions detected as the temperature increases. “While the new formulations of Engenia and XtendiMax resulted in reduced emissions compared with Clarity, these field and laboratory studies suggest volatility from all the dicamba formulations tested could contribute to dicamba drift,” he concluded. He did not test FeXapan, which is identical to XtendiMax in composition. The generic recommendation is to stop spraying before temperatures reach 85 degrees Fahrenheit. Ohio State, University of Illinois and Purdue University suggest 80 F as the upper limit. “There also appears to be a minimum temperature of about 60 degrees (F) where dicamba emissions from all formulations essentially cease to occur,” noted Mueller. Calendar date doesn’t dictate lower temperatures, but University of Illinois weed scientist Aaron Hager said the majority of the volatility issues last year can be traced to postemergence applications made when temperatures were higher. Some individual states have gone beyond federal labels to set temperature cut-offs (in additional to calendar cut-off dates). In North Dakota, for example, applications are to stop if air temperature of the field at the time of application — or if the National Weather Service forecast high for the day — exceeds 85 F. The state noted that a dry and less humid environment has the potential to increase product evaporation and off-target movement. Minnesota has some similar language. Check your state for specific rules. The Engenia label makes no specific temperature suggestions, but during applicator training this winter, representatives encouraged early post applications. Larger droplets have a lower surface-to-volume ratio and can be affected less by temperature and humidity. Droplet evaporation is most severe when conditions are both hot and dry. Both BASF and Monsanto claim that Engenia and XtendiMax help lower the volatility potential by up to 90% compared to Clarity, a diglycolamine (DGA) salt. XtendiMax, which is also a DGA salt, achieves a lower volatility profile through a proprietary additive called VaporGrip that modifies pH to reduce volatility. BASF took a different direction with Engenia and developed an all-new BAPMA salt, which is a larger molecule that attempts to anchor the dicamba in place. While it seems obvious, the first step in reducing potential volatility when using the Xtend system is to use the new low-volatility formulations. Engenia, FeXapan and XtendiMax are the only formulations labeled for use in the trait system, so it’s also the law. Purdue University weed scientist Bryan Young said research by his team and other university collaborators, have demonstrated that AMS added to XtendiMax “resulted in similar levels of off-target movement to sensitive soybeans as Banvel.” The dicamba formulation Banvel, a DMA salt, is more volatile than Clarity. Dicamba’s chemical structure is what makes it volatile. “Adding AMS to the spray tank increases the potential to form dicamba acid, which is the primary form that leads to volatility,” Young explained. Mueller has also found that, under laboratory conditions, the addition of glyphosate to dicamba formulations decreased the spray mixture pH and increased the observed dicamba emissions when compared to each dicamba formulation alone. Buffer strips were too frequently ignored in 2017, acknowledged Hager. However, the ability of dicamba that has volatilized to move many hours after application makes buffers, and even wind speed and wind direction, a challenge. “University research in 2017 clearly demonstrated that even the new formulations of dicamba can volatilize for up to three days following application. Wind directions can change on day two or day three and move volatilized dicamba to sensitive vegetation,” Hager said. How much soybean yield loss is associated with the vapor movement depends on the concentration of the product, the stage of the crop and the number of times the super-sensitive soybean is exposed to drift. “While soybean yield loss from dicamba injury is important, it discounts the potential injury to other sensitive plants,” Hager noted. “Keep an eye on the temperature. Know your surroundings. There may be times when conditions just don’t allow that field to be sprayed with dicamba,” he added.